Your fiesta can be unforgettable when you add some of these great fiesta theme party supplies and party decorations to the party this year. We carry a wide array of decorations for around the room, as well as for the table, as well as a ton of fun party accessories like flags and maracas so you can decorate in style and shake the night away with style. If you want to transport your party to an entirely different place without leaving the comfort of your own home, you can add some scene setters party decoration accessories to the room. Scene setter decorations are large plastic rolls of printed plastic that can be put up on walls to make any party look exotic and festive in a flash. For people who want to throw a big party you will find all of the bulk fiesta party supplies that you need in our bulk warehouse. These supplies are sold at amazingly low prices and will make any party look unforgettable this year. If you need any help preparing for the party you should start looking at the helpful party information that is available online for free to help make your party as fun as possible. 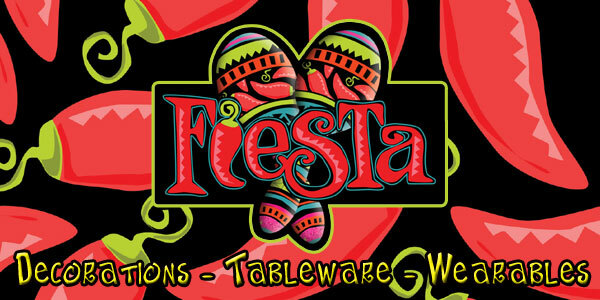 Celebrate Cinco de Mayo, Mexican Independence Day or any Great Hispanic Party with Fiesta Tableware and Fiesta Decorations! Find Bulk Fiesta Tablewarein our Platinum Warehouse too. Find Fiesta Lace Fans, Fiesta Coasters, Chili Pepper Mylar Balloons and Balloon Weights. Find a complete selection of Bulk Fiesta Party Supplies too! Find Fiesta Banner, Mexican Flag Banners and Customized Fiesta Party Banners! Find a complete selection of Bulk Fiesta Party Banners too! Creamy Individually Fiesta Wrapped Buttermints! Find Chili Pepper Confetti, Sombero Confetti and Many More Shapes! Find a complete selection of Bulk Fiesta Confetti too! Includes Fiesta Cutout Decorations of Mariachi Man and Senorita, Mexico Signs, General Fiesta Cutouts! Find a complete selection of Bulk Fiesta Decorations too! Find Fiesta Style Tissue Decorations, Fringed Mexican Garland, Window Clingers and Lots of Chili Pepper Decorations! Find a complete selection of Bulk Fiesta Hanging Decorations too! Find Mexican Flag Picks, Hand Held Flags and Mexican Flag Pennants! Find a complete selection of Bulk Fiesta Flags too! Find Wooden Maracas and Plastic Maracas and a complete selection of Bulk Maracas too! Find Two CD's Packed with Great Latin Music! Find Bulk Fiesta Stickers Too! Find Felt Spanish Hats, Sombreros, Fiesta Beads, Fiesta Sunglasses and much More! Find a complete selection of Bulk Fiesta Wearables too! Find Disposable Margarita Glasses and Margarita Shot Glasses. Find Bulk Margarita Glasses too!